Richard M. Powers (Richard Michael Gorman Powers) began by working in a conventional pulp paperback style, but quickly evolved a personal Surrealist idiom influenced by the cubists and surrealists, especially Picasso and Yves Tanguy. From the 1940s through the 1960s, he did many of covers for Doubleday. 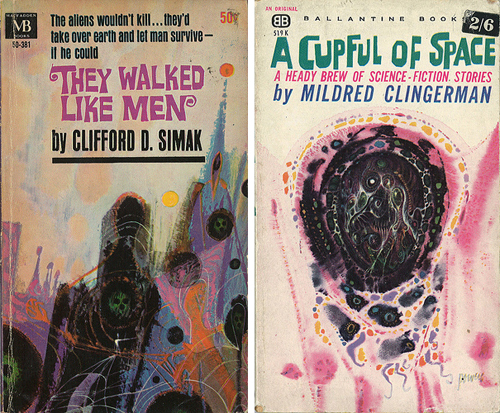 During the 1950s and 1960s, he served as an unofficial art director for Ballantine Books. Check out Levar's fantastic collection of Powers' covers.